'I stand here before you as someone who believes fully in the international order,' German Chancellor Angela Merkel told Davos. That's a wrap for day three at this year's Annual Meeting in Davos. From the future of Europe and fighting to save our oceans to Jack Ma's career tips and Prince William opening up about mental health, it was another packed day of sessions. Here are some of the key moments. Prime Minister Jacinda Ardern unveiled a new approach to running New Zealand’s finances. In practical terms, child poverty figures will be presented at every budget. The onus will be on ministers to show how spending proposals will benefit people, and work with other ministers across party lines to ensure they have a positive, long-term impact, Ardern explained. “Our people are telling us that politics are not delivering and meeting their expectations. This is not woolly, it’s critical,” she said. Twenty years later, he still has a spring in his step - and a stream of advice to pass on to young global entrepreneurs gathered to hear him speak at Davos 2019. Ma opened the session in style as he responded to a question on whether he encountered fear or doubts over the course of building up Alibaba. "Of course I was scared and had doubts. But I believed someone, if not us, would win. There are no experts of tomorrow, only of yesterday. "In business, never worry about competition, never worry about the pressure. If you worry about pressure, don't be a businessman ... If you create value, there is opportunity. Today the whole world worries. That means there is great opportunity." 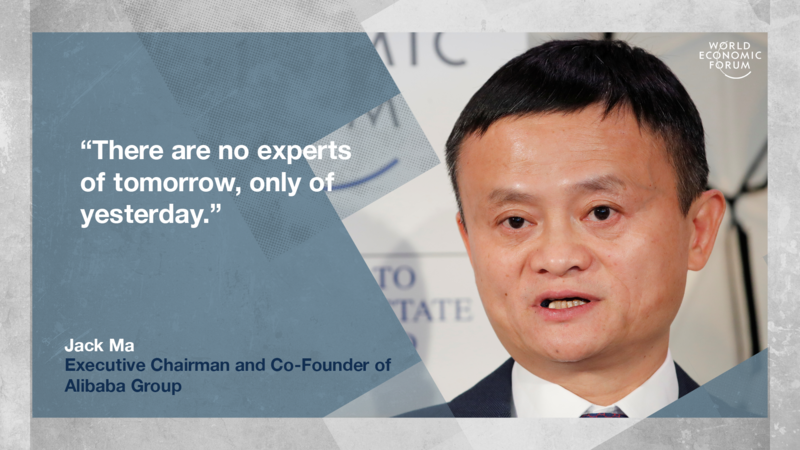 And what keeps Jack Ma awake at night? "Nothing! If I don't sleep well, the problem will still be there. If I sleep, I have a better chance to fight it." Here's a list of some of the top quotes from Ma's session. Restating Japan's commitment to the global rules-based system, emphasized by its commitment to new free-trade agreements including the recently enacted TPP11 and the EU-Japan EPA. 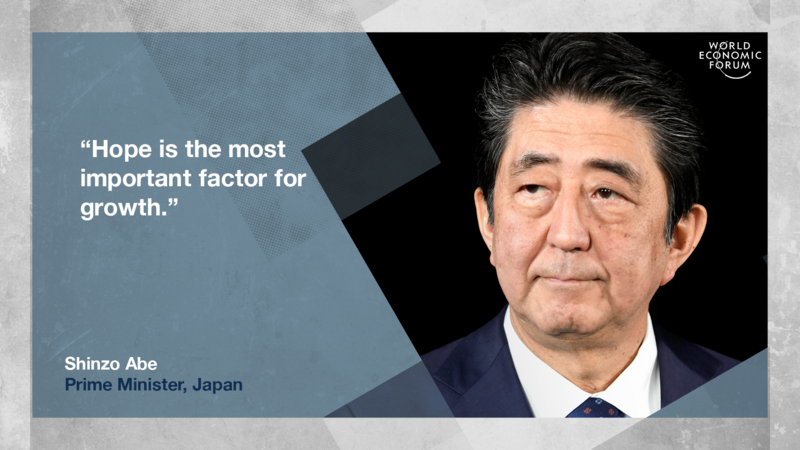 Read the full transcript of Prime Minister Abe's speech here. The UK's Prince William described how the distressing nature of his work as an air ambulance pilot prompted his own mental health difficulties. "You have a suit of armour on, you deal with children being really sick, elderly people, but something comes along that’s related to your own life and it takes you over a line," he said. He also spoke of the "stiff upper lip" mentality in British culture, which encourages people to suppress emotional difficulties. "British people particularly, we’re very embarrassed about out emotions. I take it back to the war ... A whole generation just decided this (not talking about problems) was the best way of dealing with it." Even today, he said that according to his organization's work, only 2% of people felt comfortable going to HR about mental health problems. The leaders of Germany, Italy and Spain each offered a different view on the future of Europe when they delivered their messages to participants. 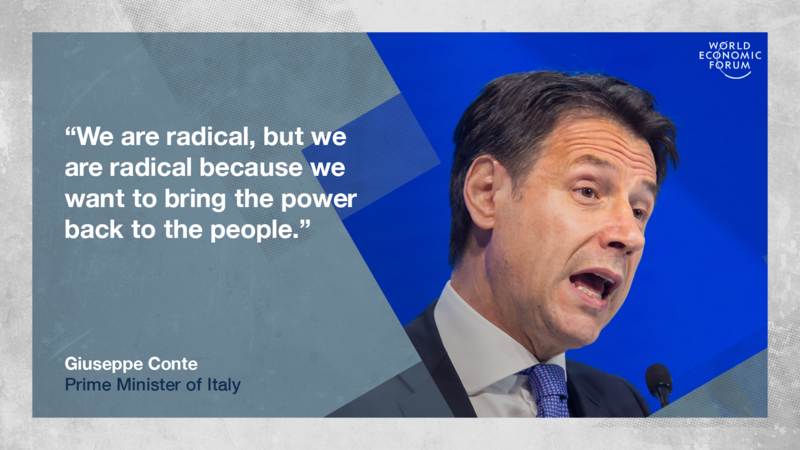 "A sense of despair is spreading," said Italy's Giuseppe Conte. "Even the middle class is facing poverty. Everyone feels that tomorrow will be worse than today ... Our experience might be an indication of what Europe will look like tomorrow," the Prime Minister said. Conte proposed some urgent interventions to "heal our severe social wounds". These include citizen income and a flexible retirement age. Germany's Chancellor took a more optimistic view, pointing to the fact that the world is a much better place with far less poverty than in 1971. And she urged people to think beyond their narrow national interests and to reform global institutions with a view to achieving “win-win” outcomes. "I stand here before you as someone who believes fully in the international order," Chancellor Merkel said. Spain's Prime Minister Pedro Sánchez started his speech by warning that we are in danger of forgetting the lessons learnt from the 2008 financial crisis. "Citizens need to feel that their fates are in their own hands, that effort, talent, courage count for something, that they can make autonomous life plans," he said. For more details on what the European leaders had to say, read this. 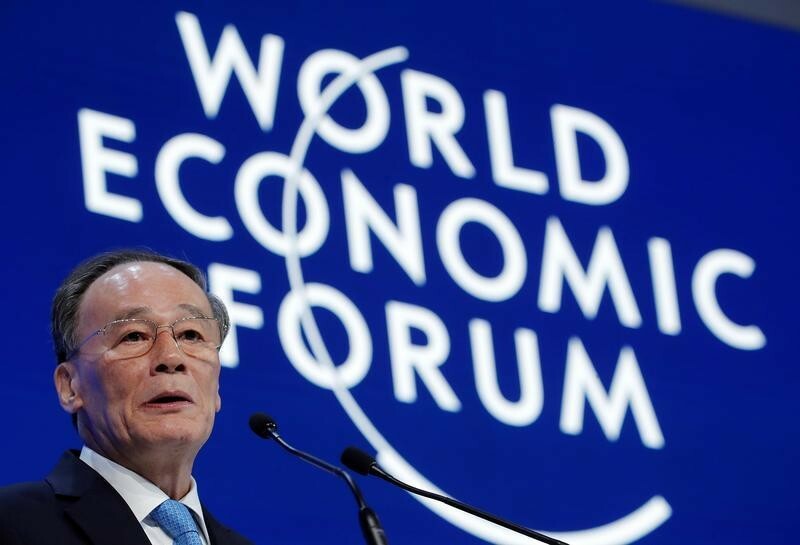 Wang Qishan told Davos that "China’s interests and future are closely linked to those of the world." "While developing itself, China also wishes to work with all countries for common development and a community with a shared future for mankind," he added. On Globalization 4.0, the Vice President also said that nations must work together, rather than turn inwards, to solve the world's problems. "In response to the problems and challenges in the world today," he said, "the international community need to make serious and deep-going analysis, and more importantly, take collective actions. "Countries need to press ahead with structural reform, strike a right balance between equity and efficiency, adopt effective policy measures to prevent the worsening of income inequality and fend off the impact on some regions and industries caused by new technologies and market competition, so that all people stand to gain from continued development." In a brief statement at Davos, Brazil, Peru and Colombia recognised the Venezuelan opposition leader as interim president, following an earlier declaration from US President Donald Trump. "We have a full-blown, global emergency", said former US Vice President Al Gore in the session, Taking Action for the Ocean. We're taking fish out, putting plastic in, and putting heat in, too. The ocean, for many people, is 'out of sight, out of mind', said Salesforce founder Marc Benioff, but there are many problems like acidification, coral bleaching and seabed mining that we need to solve. If everyone knew how serious this problem is, said REV Ocean CEO Nina Jensen, everyone would become activists. We need to improve everyone's understanding of the ocean and turn this into solutions, she added. All the panelists agreed that it's not too late to act. "Nobody can do everything, but everyone can do something," Jensen said, before going on to list three things everyone can do now to help the ocean. "First, use your vote," she said. "We get the political leaders we deserve and unless you vote for the leaders we need, nothing will change. Secondly, reduce your meat consumption, as this is a big driver of climate change. Finally, cut out all single use plastic in your daily life. Do all these things, she says, and you will have a big impact." We've been asking for your thoughts on Globalization 4.0, focussed on six key questions. "Cities are on the front line of climate change," says Robert Muggah, founder and research director of the Igarapé Institute. "Virtually every city on the planet is feeling some kind of impact of our changing climate, whether it's increasing temperature, whether its pollution, whether it's increasing sea level rise - virtually every city is feeling the heat." Some cities, however, are starting to fight back. Find out how in the video below.